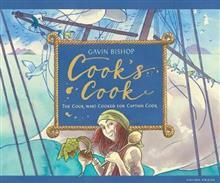 Cook's Cook follows the 1768 journey of James Cook's H.M.S. Endeavour with his ship's cook, the one-handed John Thompson, as story teller. Through real recipes, events on board and the places the ship travelled on its way to the Pacific, the book tells multiple stories. Here are stories of social class, hierarchy and race; stories of explorers and the people of the land; the story of one of the world's most famous explorers told through a fresh new lens. 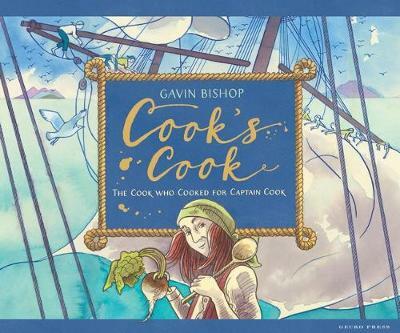 And of course, it's a book about food: from Pease Pudding to Goose Pie and Shark Steaks, here's how a resourceful cook fed a shipful of hungry sailors on their extraordinary adventure. This beautiful book is full of information drawn from extensive research alongside evocative illustrations, released in time for the 250th anniversary of the Endeavour's journey. Gavin Bishop ONZM, Tainui, Ngati Awa, is a leading New Zealand illustrator. He has published over 70 books internationally and been translated into 12 languages. He has written for television and theatre, as well as a libretti for the Royal New Zealand Ballet. His awards include New Zealand Children's Picture Book of the Year in 2000.